"I think the ocean provides a constant source of fascination, a time and place for meditation and a spiritual experience that both challenges and soothes. It’s impossible to be grandiose when the vast seas remind us how insignificant we really are." Human survival is inextricably linked with the health of the oceans. That vast blue portion spanning seven-tenths of Earth’s surface contains our lifeblood. The sea is the universal source, home to the elements, ecosystems, and creatures that nourish us — mind, body, and soul. We rely on the oceans every day for food, water, oxygen… but even greater than the sum of these benefits is the intrinsic value the aquatic world offers our daily lives and even identities. There are now psychological studies exploring and documenting water's calming effects on people. Our own bodies are mostly water; an adult human brain is about seven-tenths H2O. No wonder we flock to the sea to holiday, to play, to heal, to think, to sit in stillness until we remember who we are and how to be, or to capture and share the beauty in all of the above via a knack for timing and a water-proof camera. The ocean inspires, challenges, and humbles with its depth, mysteries, and might. For the benefit and wellbeing of marine and landlocked species alike, each feature yields no shortage of incredible photo opportunities. We asked UK-based surf photographer Alistair "Al" Mackinnon about his love of the oceans and hopes for its future. What is it about the oceans? Why surf? So tricky to answer, it’s such a multifaceted experience. I’ve loved being in and around the water as far back as I can remember, from learning to bodysurf, to standing up, free diving, scuba diving and low water fishing. I think the ocean provides a constant source of fascination, a time and place for meditation and a spiritual experience/higher power that both challenges and soothes. It’s impossible to be grandiose when the vast seas remind us how insignificant we really are. Do you have an ocean hero? My father; he introduced me to the wonders, from little to large, to always avoid unnecessary harm. He taught me to respect the tides, never take my eye off the water, to snorkel and body surf at a young age. Also, as a young lad, I used to very much enjoy reading Jacques Cousteau books. Favorite sea creature: This is almost impossible to answer… I love the playfulness of sea lions and dolphins, how gentle turtles seem, but have always been drawn to the weird and wonderful, such as Leafy sea dragons and the Lacy scorpionfish. A serendipitous ocean highlight for me came whilst doing research on barracuda near Madang in Papua New Guinea. I spotted a fish that had only been recorded a handful of times (maybe as little as two or three) throughout history. I can’t recall its name now, it looked like a cross between a seahorse and scorpionfish and was incredibly well camouflaged until disturbed, when it flashed brilliant technicoloured pectoral fins whilst trying to make can escape. I’ve always wanted to dive with whale sharks! What's the most incredible marine environment you've ever visited: In terms of biodiversity it would have to be north Papua New Guinea, but probably the one I enjoyed most was Galapagos; swimming with sea lions is just inexplicably good fun! The first pillar of the Parley A.I.R. Strategy is Avoid. What's one habit you wish people would pick up (or drop) to help reduce plastic waste? Again, too many to mention, but avoiding single-use plastic is the catchall. I think practically speaking one should avoid buying plastic water bottles. Get a reusable metal one and refill from the tap. If helping the environment isn’t enough of an incentive, you’ll even save money! I actually carry several, so I always have a stock of water. I can’t recall the last time I bought a bottle of water. Additionally, always keep reusable shopping bags at hand, it’ll save you getting caught short and having to use disposable. Lastly, make the most of things that have already been made. If you have plastic bags or water bottles, reuse them and ideally be prepared to pay a little extra for something that’ll last. We simply MUST break this throwaway culture. One thing people should know? Crikey, that’s a big question and I’m not sure I’m qualified to answer! I suppose we all need to make ourselves more aware and remember that as humans we are animals too. We may be able to do all sorts of cool things, but we’re part of the ecosystem like any other creature on this planet. It’s hard as a human to have no negative impact at all, but don’t berate yourself for your existence. Do your best to ‘keep your side of the street clean' and collectively that’ll make a huge beneficial impact. Any projects you'd like to share? Some like-minded people and I have just started a magazine called Backwash — for each issue, we give something back. For instance, issue one we're planting a tree for every magazine sold. You can find us at www.backwa.sh and on Instagram at backwa.sh. Also, if you enjoyed my pictures and would like to see more and follow my travels, I’m on Instagram at almackinnon and my website can be found at www.almackinnon.com. Emerging It's easy to forget that humans are animals and in an era when mankind appears increasingly removed from nature, surfers tend to buck the trend; they are more connected to the natural world than most. Here, Australian surfer, Russell Bierke, 'duckdives’ though crystalline waters, between the explosion of the wave and the famous coral reef at 'Cloudbreak' in Fiji. Ever Stormier Winters Two of the results of climate change are rising sea levels and less predictable weather. Coastal communities and buildings that have stood for a hundred years or more face an uncertain future. This was shot on the south coast of Cornwall at Porthleven during a particularly impressive winter swell. Casual cool Oh to be a young Galapagos sea lion! Their playfulness and mastery of the medium are a treat to see. I couldn't help but notice this one's pose, as it relaxed upside down, it almost looked like it was leaning on the water's surface, as if gravity was reversed. Fellow mammals having fun Whilst swimming in a Galapagos cave, a handful of sea lions joined us. The two things I recall are the joy of their remarkable underwater acrobatics as we chased each other around (this one particularly appreciated gnawing on my flippers!) and the incredible water colour, the sumptuous blue, the likes of which I've never seen anywhere else. Backlit beauty Freddie Meadows in an early morn backlit British Beauty. The North Sea's drab brown/grey water slabs come alive with colour and flaring barrels on the rare days when sun and swell combine. 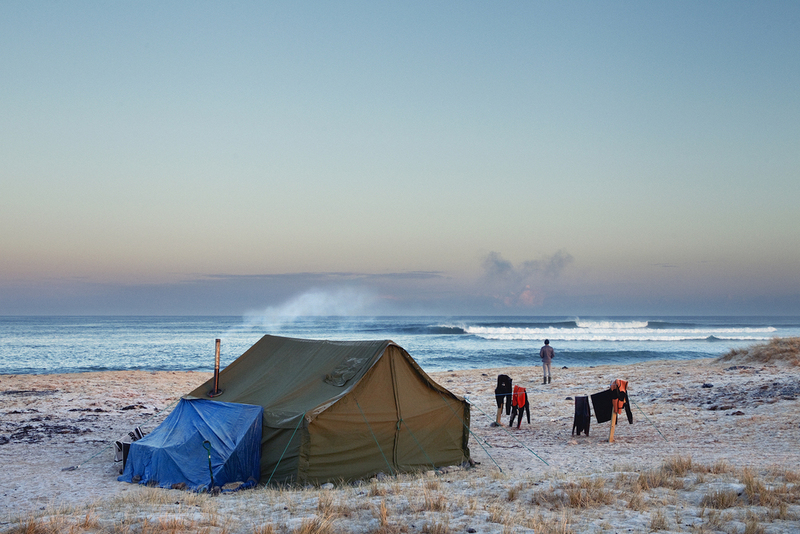 No crowds, no pressure, no rush Surf campsites don’t get much ‘cooler’ than this. Strictly speaking it’s not a formal campsite, but rolling out of bed in the morning, into your wettie and walking a hundred yards to a point break has meant a handful of knowledgeable surfers have made it so for years. Here an empty set rolls through, smoke rising from the woodburner in the Swedish army tent and fresh from his sleeping bag Gregor Matthews - longjohns, gum boots and all - stands admiring an empty set as the first light touches the frost-laden dunes. Greg Long, biggest Dungeons I've been blessed to have seen some breathtaking sights, but this particular moment will live long in the memory. The story behind this photograph of Greg Long riding this monster at Dungeons, South Africa, features in a recent book, 'Amazing Surfing Stories' by Alex Wade and has been printed in magazines the world over. This picture won Greg and me the Billabong XXL Biggest Wave Award 2006/7 (now WSL Big Wave Awards) for ride and photograph. Incredibly, Greg is not just a phenomenal surfer, but also a gifted orator, particularly in raising awareness for environmental causes worldwide. The Syncro My beloved Volkswagen Syncro. We went to some beautiful places together, often for months at a time. It was incredible having a campervan that was so capable off road, in this case the only sign of life being the tracks of inquisitive sheep around the van. My Hero My old man, post surf grin, holding his trusty wooden board. These bodyboards were made by Grays, this one is about 50 years old and provides as much stoke today as the day it was crafted. My grandmother rode these, my whole family have at some stage. My father regards bodysurfing or using one of these boards as ‘real surfing’. Despite my now standing up most of the time, I adore bodysurfing and the connection one has being so immersed in the wave is undeniable, I suppose parents are always right! The office Outer island crystal voyager, somewhere in the North Atlantic. Why surfing? Well, the sensory overload of tube riding is a pretty good reason. Hailstones and hacking offshore The scene at Mullaghmore Head as a squall of freezing rain and storm force winds whip through the lineup. In between the perceived glamour of big wave riding visibility is reduced to almost nothing and you just have to look away and let your back be pelted with icy marbles instead of your face - and hope that during all of this you haven't drifted into the impact zone. Turtles, contre jour A high tide coincides with a good sunset on the Great Barrier Reef, Australia. Although it is all linked, the GBR is actually made up of over 3000 individual reef systems that together are larger than the Great Wall of China, indeed the GBR is the only living thing visible from space and has been described as one of the seven wonders of the natural world. View more of Al's work.